Yes, I am a hypocrite. About four blog posts back, regular readers 😃 will recall, I was riding my high horse about the hideousness of big cruise ships and declaring that I would never lower myself (er, from that high horse) to set foot aboard anything bigger than 900 passengers. Well, guess where I am right now? Oh yes, comfortably ensconced on the Viking Sun, home to 930 smug guests. And here I will be happily staying, as it sails from Auckland to Wellington, as part of the 130-day world cruise it began in Miami at the start of the year, ending in London. This was one of the lastest-minute famils I’ve ever participated in: 48 hours from offer to boarding, which is only slightly dizzying because all it took was a ferry trip and a short suitcase trundle along the wharf. 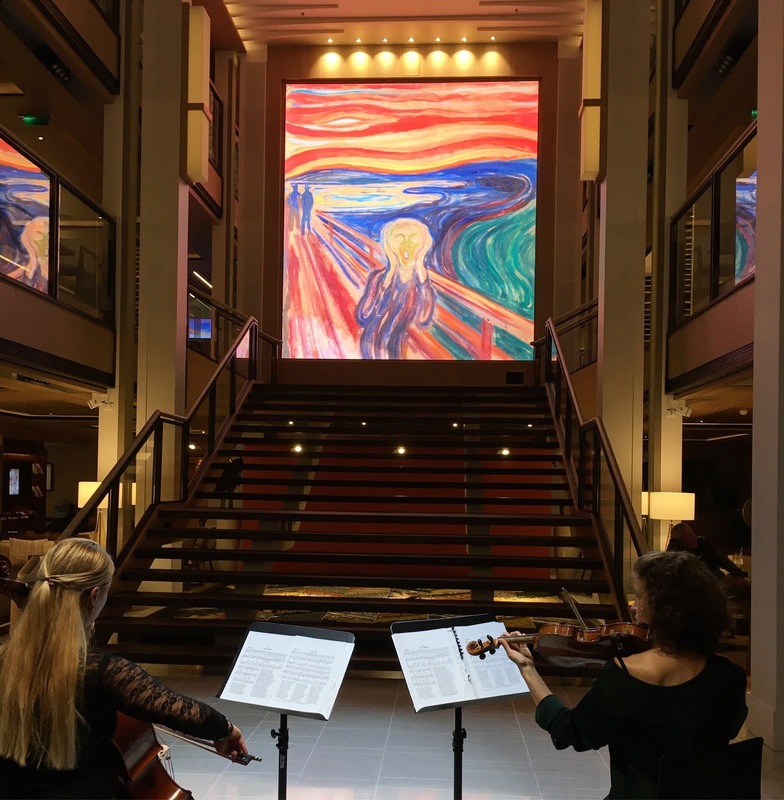 The ship arrived this morning, and is overnighting in Auckland before departing tomorrow afternoon, so I could actually have delayed my embarkation until then – but why would you, and deprive yourself of a night’s dinner and entertainment? So here I am, in a suite that is a touch on the snug side but, since the ship is pretty new (2017), it's neat and elegant and eminently acceptable. All Viking suites have verandas, and as we are happily on the starboard, ie landward, side (we will be sailing south down the east coast – can you work that out?) the sun is shining in through the ranchslider beyond which is the Cloud on Queen’s Wharf and just above its roof a peep of the harbour bridge, busy with rush-hour traffic. Soon after boarding, I fortuitously tagged along on a travel agent tour and have already seen all over the public areas of the ship. Right now they are all still a confusing muddle, but I have hope that I will get everything sorted by the time we reach Wellington on Sunday. First impressions are of easy elegance, lots of blue and beige and blond wood, many appealing places to sit, quantities of glass, a very Nordic presence in terms of artwork, a novel (to me) infinity pool at the stern, and some seriously tempting restaurants. I have already learned that all the flour used in the kitchens (by France-trained chefs) is French, so I have high hopes of proper croissants and baguettes; and more than one person has strongly recommended the beefsteak at Manfredi’s Italian restaurant. I have been urged to try the Nordic bathing experience, which includes an actual snow room, and a bucket shower. Tonight there is a Maori concert party in the theatre after dinner; beforehand there will be Norwegian music in the atrium; and I am hoping that both the Irish flautist and – tarah! – old Buskers Festival faithful Nick Nickolas, who are part of the entertainment programme, will be performing before I disembark in Wellington. Fingers crossed. Yes, very happy not to be on that particular Viking ship. Knowing they're all identical, I've been able to empathise especially well with the poor passengers on board.